Co. Galway: Ballinastack, Ballymoe, Ballynakill, Boyounagh, Carrownagur, Clonkeen, Creggs, Curraghmore, Glenamaddy, Island, Kilcroan, Kiltullagh, Raheen, Scregg, Shankill, Templetogher, Toberadosh, Toberroe. The Guardians met each week on Wednesday. 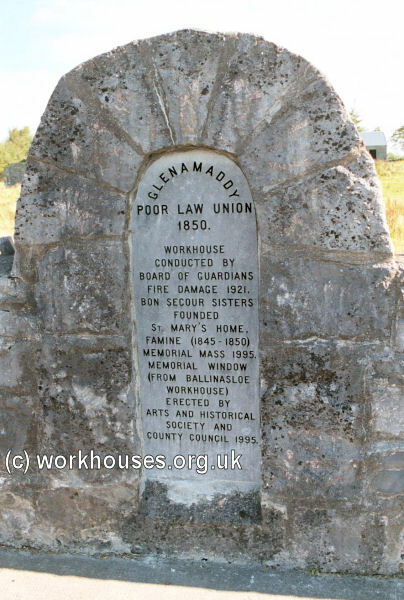 The new Glenamaddy Union workhouse was erected in 1853 on a six-acre site to the south-east of Glenamaddy. Designed by the Poor Law Commissioners' architect George Wilkinson, the building was based on one of his standard plans to accommodate 500 inmates. Its construction cost £5,250 plus £995 for fittings etc. The site location and layout are shown on the 1916 OS map below. The design was somewhat different to Wilkinson's earlier plans, and was a similar size and layout to workhouses such as those at Urlingford and Mitchelstown which were built at around the same time. The front of the site at the south had an entrance gateway flanked by two two-storey blocks containing school rooms and accommodation for boys and girls. A dispensary was also located at the workhouse entrance. 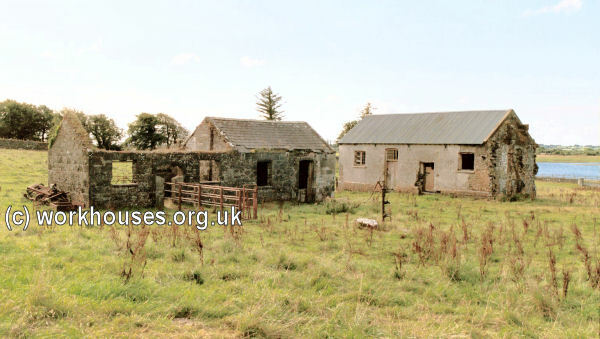 Glenamaddy workhouse site from the south, 2003. 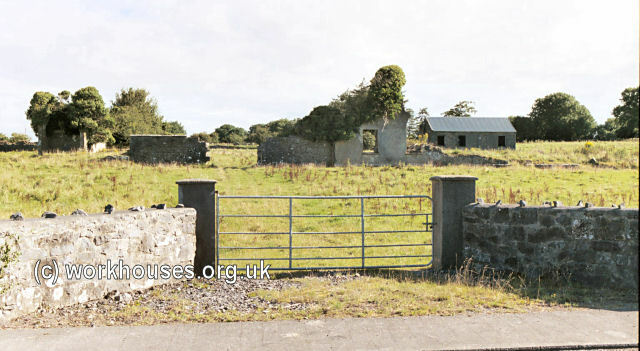 Glenamaddy workhouse entrance from the south-west, 2003. To the rear, the main buildings had a T-shaped layout. The central wing running southwards was probably a single-storey block containing the dining-hall and kitchens. To each side were accommodation wings for men and one for women. 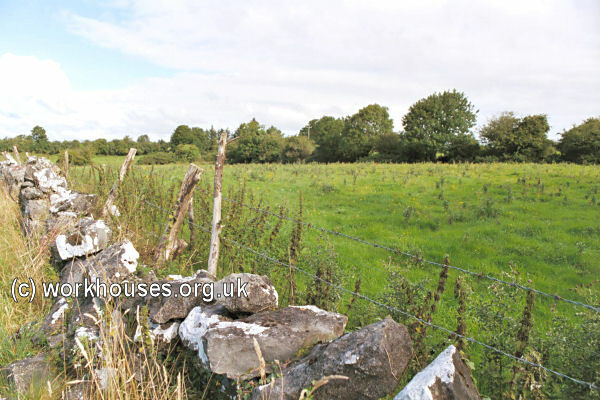 Glenamaddy workhouse site from the east, 2003. 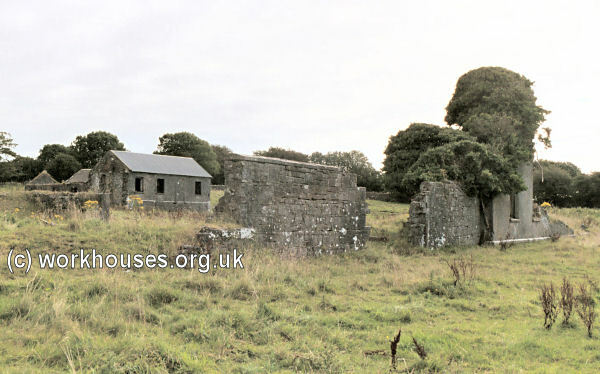 Glenamaddy workhouse site from the west, 2003. A hospital block lay at the north of the site, with a fever hospital and burial ground close by. Glenamaddy burial ground from the south-east, 2003. From around 1900, nursing at the workhouse infirmary was under the charge of the Bon Secours Sisters. The main building was burnt down by Repuplican activists in 1921. The hospital section later served as an orphanage and as the district dispensary. The remains of buildings now lie derelict. A memorial stands at the roadside. 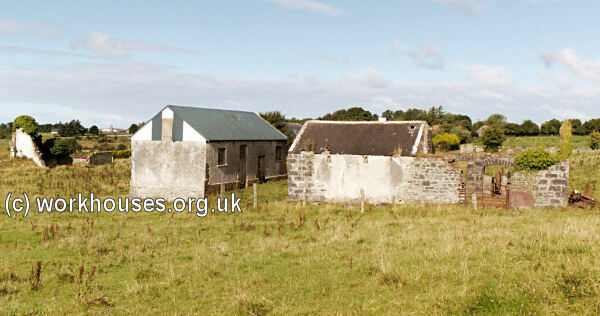 Glenamaddy Heritage Project workhouse page.